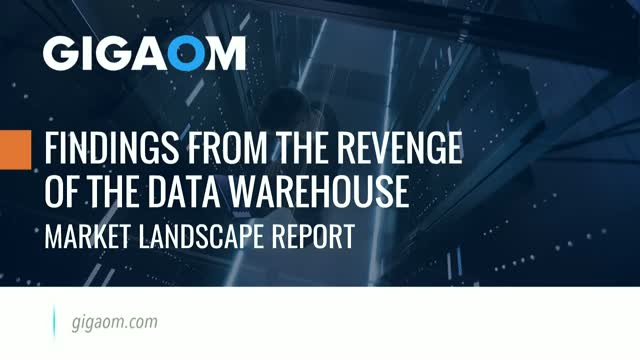 Join GigaOm analyst, Andrew J. Brust for this free 1-hour webinar as he shares his finding from his recent market landscape report, The Revenge of the Data Warehouse: How a Classic Tech Category Has Evolved, and Triumphed. This report maps out today’s DW landscape in the context of where the technology has been, where it is, and where it is going. Webinar attendees will learn how best to select and use DW platforms; combine them with other technologies, the key differences between DW vendors and their offerings, and more. The driving force behind most enterprise digital transformation initiatives is a fundamental need to enhance productivity, increase operational efficiency and create a competitive advantage. It’s why so many companies are seeking out and investing in more powerful mobile devices that help their staff work smarter, more efficiently and more collaboratively. But empowering enterprise workers to elevate outcomes requires enterprise-specific solutions. And, far too often, companies are instead turning to consumer smartphones as a solution—only to realize critical shortcomings that lead to higher cost of ownership and disappointing results. In this webinar, you’ll learn why it pays to factor in the hidden costs of time and budget that are often overlooked with consumer phones, including insufficient support and limited security that falls short of protecting sensitive data across enterprise systems and solutions. Join us for this free 1-hour webinar from GigaOm Research, featuring GigaOm contributor Bob Egan and special guests, Andrew Duncan, Vice President of Product Management and Technology Solutions from Spectralink and David Krebs Executive VP, Enterprise Mobility and Connected Devices from VDC Research. This free 1-hour webinar from Gigaom Research brings together leading minds in digital business transformation, featuring Gigaom Senior Executive Analyst Bob Egan, Samsung’s Knox expert, Valerie Espinoza, Hipaax’s Founder and CTO, Bharat Saini and UCHealth’s Kyle Toburen and Edward Horowitz. This roundtable conversation will discuss how businesses are finding new ways to customize technology to solve business challenges. As employees and customers become increasing digital, businesses must find new ways to provide up-to-date information and content in a secure and cost effective way. With device customization technology, businesses can transform off-the-shelf hardware into single-purpose devices designed with both employees and customer needs in mind. •Samsung’s Knox expert Valerie Espinoza, reviews several ways businesses have used customized hardware and applications to solve business challenges in healthcare, education, retail and more. •UCHealth’s Kyle Toburen and Edward Horowitz discuss how customizing tablets with preload applications helped increase overall employee and patient satisfaction while maintaining HIPPA compliance. •Hipaax’s Founder and CTO, Bharat Saini provides insight on the deployment process and implementation of a custom wearable solution to meet a specific business needs. This free 1-hour webinar from Gigaom Research brings together leading minds in DevOps, featuring Gigaom principal analyst Jon Collins and Puppet's Nigel Kersten in a discussion about the practicalities of delivering on the benefits of DevOps. As increasing numbers of organizations look to DevOps as a way of delivering on their innovation and continuous delivery goals, they are confronted with many challenges — to the extent that they might conclude that DevOps isn’t for them. At the same time, decision makers looking to automate and simplify integration, test and deployment activities recognize that tools cannot be adopted in a vacuum. So, how can organizations take a pragmatic position on DevOps, and what lessons can they learn about delivering both efficiency and effectiveness, and above all, make things simpler with DevOps automation? In this webinar, we consider the options now available to simplify development and operations tasks. We look at the role and scope of model-driven management, for example where it needs to be supported by discrete activity. And overall, if DevOps is a journey, we consider lessons to be learned from those further down the path. What challenges are enterprises looking to address with DevOps today? How can decision makers determine if DevOps is valid for their environments? What automation options are available for those adopting DevOps practices? Why are organizations adopting best-of-breed DevOps automation approaches? How can decision makers navigate bureaucracy and demonstrate value? What is the role of management data and visualization for development decisions? Why are maturity models the wrong starting point for the DevOps journey? Are there other factors to consider such as organization, process? This free 1-hour webinar from Gigaom Research brings together leading minds in CRM for the financial services industry, featuring Gigaom head of research and CIO Tim Crawford joined by NextJ thought leaders in a roundtable discussion on how to transform customer engagement in financial services. In today’s hyper-competitive business climate, companies are looking at differentiated services to build stronger relationships with their clients. Specifically, in the financial services industry, the competition for both commercial and retail products is fierce. This webinar delves into the opportunities that come from domain expertise that industry-specific solutions deliver. In addition, we look at the ways that companies can develop differentiated services to build stronger relationships with their clients. We cover approaches specific to the financial services industry, including AI and machine learning, to better understand customers in ways that makes it hard for others to compete. •What are the challenges that financial services organization face today? •How does customer engagement and loyalty play a role? •Does domain expertise in the financial services industry benefit CRM? •CRM is not new. What is the value from an industry-specific CRM solution? •How are regulatory/ compliance and KYC issues addressed? •Is integration with other systems/ data sources a key issue? •How does Machine Learning and AI fit in? Led by GigaOm Analyst David Linthicum, and co-presented with Simon Gibson and special guest, Carsten Puls, Senior Director, Frame at Nutanix, this free 1-hour GigaOm Research webinar focuses on the value of desktop-as-a-service platforms to simplify multicloud and remove complexities. As the world of IT, including cloud, becomes more complex, private and public clouds are increasingly expected to replace traditional computing and eventually make things easier. However, for most enterprises, the cloud is now an additive to existing traditional systems, and that adds complexity and reduces business value. The concept of desktop-as-a-service including how it works, what it is, and where to get it. How things have become complex, and how to measure complexity for your enterprise. How to understand the business value of dealing with complexity. Steps toward mapping out a course of action. Interfaces, or ways that the users interact with the infrastructure is key to removing this complexity. This is the approach where user interfaces are virtualized, in short, complexly abstracted from the complexity of the underlying environment including clouds. A world where IT is more simplistic, thus more productive to the business. So where to start? Begin by addressing complexity head-on. Modern IT requires innovative and scalable storage infrastructure solutions that bring on the premises the same agility, flexibility and variety of the public cloud, without giving up on predictable and consistent performance, or the high availability necessary to run most enterprise applications. All of this is needed while granting seamless application portability and combining private and public resources to get the best of the two worlds when necessary, in a hybrid cloud fashion. This webinar is designed to inform and educate companies that are considering innovative solutions for their cloud strategy, giving both technical and business perspectives on the covered topics, about how next-generation two-tier storage infrastructures can meet cost-conscious agility and flexibility across multiple clouds. Join GigaOm Analyst Simon Gibson CISO, Analyst Graham Melville and Security Consultant Iben Rodriguez, for an for an in-depth webinar discussing the importance of preventing cyber attacks by stopping phishing. They will explore how to stop phishing, protect your networks, and enable this vital cornerstone of a successful security program. In this one-hour webinar, we examine multi-cloud complexity and present the best path to solve its resulting problems. We look at using state of the art approaches and purpose-built enabling technology, addresses the complex concepts, and discuss the things you can do today to ensure that you’re on the right path to multi-cloud and that your multi-cloud solution works right the first time it’s put in place. In this webinar, industry experts delve into understanding what IT maturity is and how it relates to cloud computing. Attend this webinar to explore the beneficial methodologies and key success factors employed by today’s most successful organizations. Understand the importance of preventing cyber attacks by exploring how to stop phishing, protecting your network, and how to enable the vital cornerstones of successful security programs. Learn about the potential for security challenges in your DevOps environment and what technology tools and best practices you can use to resolve this dilemma. Attendees of the webinar will come away with a better understanding of how mobile marketing will impact their business as well as actionable advice on how to leverage ad spend, increase reach into key demographics, improve conversion and build brand equity. Emerging market research for topics including but not limited to emerging technologies, Application development, and CxO Strategy.